An photo posted on Twitter shows dozens of Palestinians joining Bab Al Shams. Hundreds of Palestinians remain camped out tonight as Israeli occupation forces prepare to drive them out of Bab Al Shams on orders from Israeli Prime Minister Benjamin Netanyahu. 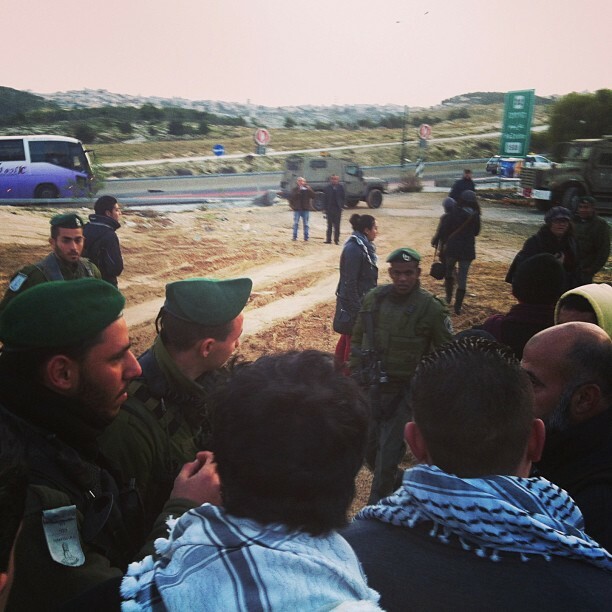 Huge force of police and army is surrounding the area of #BabAlShams, we are all gathered, no fear! Despite this, earlier on Saturday, dozens more Palestinians climbed hills to join the more than 200 who yesterday established Bab Al Shams, a new village on Palestinian land in the occupied West Bank that Israel has seized in violation of international law for new Jewish settlements. Among those heading toward the village was Suheil Nafar a member of internationally-acclaimed Palestinian hip hop group DAM, who posted photos of the scene in the vicinity of Bab Al Shams on his Instagram account. Occupation forces surrounding Bab Al Shams delivered an ultimatum that the activists, who spent their first cold night at the new village, should leave the site in the hills east of occupied Jerusalem or face forced expulsion. Later on Saturday, Israeli media reported that Netanyahu has asked the Israeli High Court to overturn a temporary injunction preventing the expulsion. Abir Kopty and Irene Nasser, among others, have been tweeting live updates as they happen, using the hashtag #BabAlShams. Israeli police and soldiers are at every corner around the area of #BabAlShams but still the ppl are managing to get in amazing ! Israel’s military handed evacuation orders to activists in the Bab al-Shams, or ‘Gate of the Sun’, protest village on Saturday, stating that the military intends to move protestors by force, local activist Abdullah Abu Rahma said. Israel’s military has also prevented activists from neighboring areas access to the protest village since Friday. “We only have our determination, and it will not be easy to expel us from our homes. We will use our experience and skills to remain on the land,” Abu Rahma said. Al Jazeera English published this video report by Jane Ferguson. Keep an eye on the Twitter accounts mentioned above to follow events as they happen. Israel defines itself as a Jewish state and will never accept a non apartheid democracy with a Jewish minority. Continuing illegal annexations, settlement expansion and ethnic cleansing have also precluded any negotiated two state solution. Justice may now be served only by UN and NATO imposing resolution just as involuntary, disruptive and humiliating to Israel as Israel has wreaked upon occupied Palestine for generations. The Jewish State must be made to recognize an armed Palestine with externally enforced autonomy, eviction of all settlers, true contiguity encompassing Gaza, the West Bank and Jerusalem together, neither pinched nor parceled, and pay punitive reparations. When Che and Fidel came down from the mountains they were joined by supporters. That support grew to the thousands and thousands until they were a sea of humanity flowing to Havana. The hasbara spokesman lies with a straight face in the video -- evidence of professional training in hypocrisy. I hope the real owners of this land see village establishment as the beginning of a massive wave of peaceful resistance. Bibi obviously recognized the potential of this tactic.